I have been busy, I have been sewing, I am slowly, slowly clawing my way back to being in control of what I'm meant to be doing. Must go get on with things whilst I feel up to it.... I'll be back soon! Amazing quilt top. I am so impressed with all the Stained Glass quilts that people are making. I shall add one to my 'list'! the man needs a little more training, clearly! I suggest hooks as a safer option to random nails sticking out! 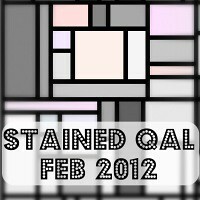 Stained II is looking suitably wonderful! Stained II looks great - at least he co-operated enough to paint and hold. Great to see Stained II - those arms will be begging for nails soon! The top is yummy, I thinking may be getting mine all joined together today, yippee!!! Do you reveal more of the man each time like A question of sport!? Great quilt but tell him to hide the plastic bin next time! hehe! I love it! It is amazing and looks great! Wow, that is just stunning! this quilt is VERY pretty! I think it is hilarious that we keep getting these fingertip and bottom of leg views of the other people in quilty bloggers lives, it could be anyone behind there....haven't seen brad pitt for a while, perhaps he is hiding behind a quilt?! Quilt top looks fab, as does the white wall. Can't you bang some nails in when he goes back to sea?